This soup has been made with ingredients that could also be a salad. 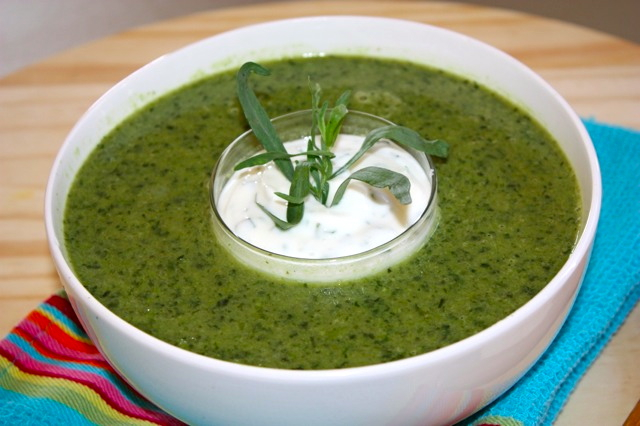 So if you are tired of lettuce salad, you can turn it into a delightful soup. Soups have a healing and cleansing effect and are so nutritious, so they’re the perfect reason to be part of anyone’s diet. You can certainly cook lettuce or braise it. Its use is not limited to being eaten raw in salads. Being a leaf, it can be used as spinach or chards or as any other green. Since lettuce tends to be bland, I like to enhance it with fresh herbs. You can also use cannellini beans or chick peas instead of peas. In France, they often add a tbs of crème fraîche in a velouté, or vegetable cream. I prefer to use yogurt to keep it lighter, it’s a personal choice, but cream would also work. As far as, texture, you can blend it into a fine and smooth texture, I kept it more grainy, it’s all up to your personal tastes. Heat olive oil in a pot. Add onions and let soften, then add lettuce. Let it wilt, add broth (to cover the lettuce mixture). Cover and let cook for about 15 minutes. Add peas and herbs and let cook for an extra 10 minutes. Blend soup in a mixer or hand blender. SErve hot with a tablespoon of cream of herbs. 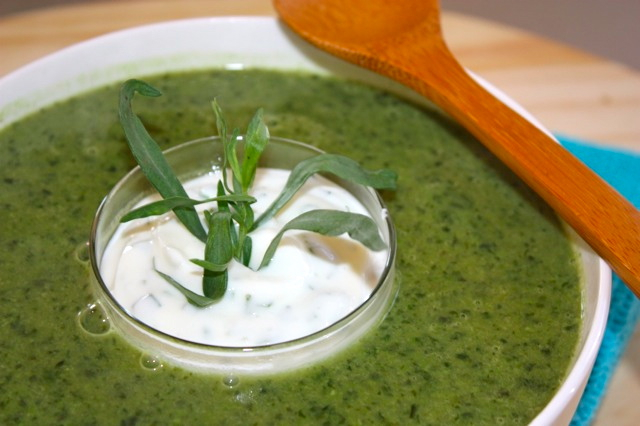 Mix 1 tbs of tarragon and 1 tbs of chervil with yogurt and stir. This entry was posted by silvia on December 13, 2015 at 1:12 am, and is filed under Soups, Vegetables, Vegetarian - dairy. Follow any responses to this post through RSS 2.0.You can leave a response or trackback from your own site.